I have always seen Simple skincare products displayed in mass retailers and drug stores whenever I browse around the health and beauty department. And I always spot their coupons in coupon flyers. I do clip them out and put them in my little coupon book (Yes, I'm one of those who coupons, no I'm not an extreme couponer). So why haven't I given these products a try? They seem like a promising brand that cares about skin. Don't worry, it's not them, it's me. If you've seen all the skincare products I have around the house, I really shouldn't be making any skincare purchases for a few years. But when an opportunity comes forward, especially when it's something I have seen and heard great things about, all else gets put on hold. Made with Micellar Water for a thorough yet gentle cleanse. The clever micelles lift away make-up, impurities and unclog pores all while hydrating the skin. The skin is left feeling clean, fresh, and hydrated without irritation. These wipes are the softest makeup wipes I have ever tried. It's almost like wiping your face with a soft damp towel - unlike other wipes that seem like wet paper towels (by the way, nothing wrong with that, it still does the job at removing makeup). Besides softness, the wipes are completely scentless and did a great job at removing ALL my makeup - including waterproof mascara and lip stains! It left the skin feeling clean with no sticky business. A perfect blend of multi-vitamins, skin loving ingredients and gentle cleansers to cleanse the skin while removing make-up. Simply apply a generous amount to a cotton pad, wipe the cotton pad all around the face and gently around closed eyes, no need to rub the skin or rinse after. 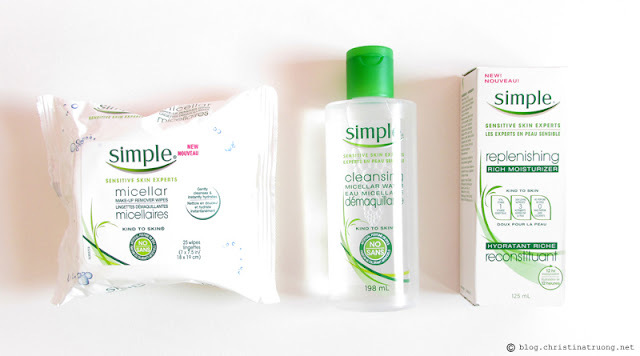 I used the cleansing water after using the Simple Micellar Make-up Remover Wipes. The cleanser was very gentle and remove any excess leftover makeup I might have missed earlier. Just like the make-up remover wipes, the cleanser is completely scentless. In the end, it left the skin feeling clean, soft, and hydrated. A perfect blend of their purest possible skin loving ingredients (Pro-vitamin B5 - helps restore, soften and smooth) with added vitamins (Glycerin - hydrates and nourishes. Bisabolol - help soothe and calm. Allantoin - helps soften). Simple Replenishing Rich Moisturizer instantly doubles skin's hydration by leaving skin replenished and nourished all day long. When it came to the moisturizer, I loved everything about it except one thing - the scent. I know it's meant to be scentless and I know when it comes to scentless moisturizers and lotions from any product, they tend to have a scentless scent. In this case however, it seemed a bit too scentless or (maybe it's just me) an off odour that lingered around. Other than the scent, I really liked how the moisturizer absorbed into the skin quickly, leaving it feeling hydrated, soft and no greasy residue. Overall, the Simple skincare products are amazing and I wished I had tried them sooner. No dyes, artificial perfumes or harsh chemicals while providing a clean, moisturized and hydrated skin. Best of all, it's suitable for all skin types (even sensitive skin), it's a must try for everyone! What are your thoughts on these Simple skincare products? Have you tried Simple skincare before? If not, definitely give them a try and let me know what you think. Simple products can be found in mass retailers, drug stores, and grocery stores. Disclaimer: Products complimentary from ChickAdvisor for testing/review purposes. Views expressed are of my own.